Padmavati Devi is said to be the deity of Parshvanatha, the 23th Tirthankara or a Liberated Living Master. She is also considered by some to be a most powerful Yakshini, associated with Parshvanatha. There are numerous Mantra and Yantra Sadhanas and Experiments for all kinds for most purposes, dedicated to Padmavati Devi, including Sadhanas and Prayogas related to Vashikaran, Destruction of Enemies and Gain of Wealth, Money and Abundance. These Mantra, Yantra Sadhanas and Prayogas are very popular, which is an indication that many people have gained success by practicing these Mantra Experiments. This site has over the past many years published several Mantra, Yantra Experiments of many kinds for invoking those mentioned above. The Mantra Experiment given in this post can be practiced by following the procedure given below. 1] The Mantra Prayog is for 10 days and it should be started on any auspicious occasion, like a festival or Shubh Muhurat. 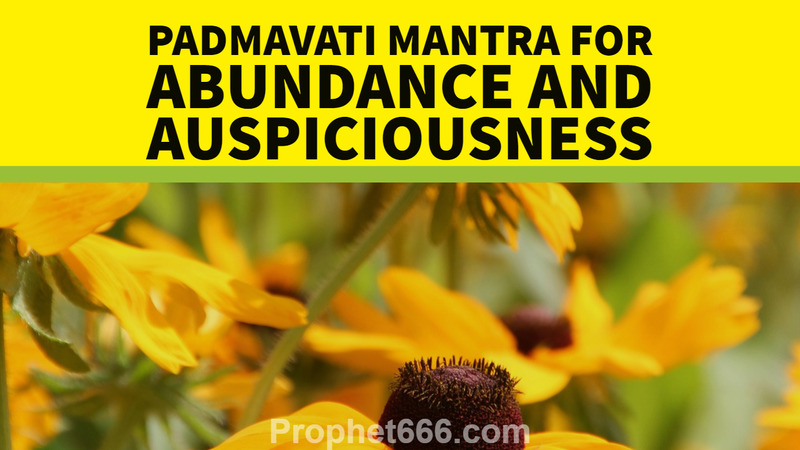 2] The practitioner has to get up early in the morning, have a bath, wear clean white colored clothes and chant the Padmavati Devi Mantra given below 1008 times, while offering white flowers to the Goddess. This means you have to chant the Mantra and offer a white colored flower. Note- The Padmavati Mantra Prayog for Abundance and Auspiciousness is simple and easy to practice, but during these 10 days, the practitioner has to control his emotions and anger and refrain from talking ill about others or gossiping, he should practice celibacy, consume Satvik vegetarian food. Hi Neel sir, do you mean 1 flower per chant.
? Total 1008 white flowers need for this ritual. 1 flower to be offered to the Goddess, per Mantra Chant, total 1008 flowers. श्री पद्मावती सहस्र नामस्तोत्रम से विदित होता है कि यह देवी तीर्थंकर पार्श्वनाथ की आराध्या रही हैं .यह सहस्रनाम अद्भुत है ,जो सौ-सौ नाम के दस शीर्षकों ---पद्मावती शतम ,महाज्योतिर्मती शतम,जिनमाता शतम,वज्रहस्ता शतम ,कामदा शतम ,सरस्वती शतम ,भुवनेश्वरी शतम ,लीलावती शतम ,त्रिनेत्रा शतम और चक्रेश्वरी शतम ---में अंकित है .अंत में फलश्रुति के रूप में प्रशस्ति है ,जिसके अनुसार पाठ से सब प्रकार के भय से मुक्ति मिलती है ,आपदा और दरिद्रता दूर होती है . To offer white color flower is to offer to whom or we just have to keep down? Yes, while doing that imagine that you are offering it the Goddess.